I, like many others, sat yesterday and watched the interview between Oprah Winfrey and Lance Armstrong. I watched it twice – on the Discovery Channel of all places. And I sat there with my two year old boy climbing and jumping all over me and the couch – him being totally oblivious to the whole thing. The feeling I had in the end was not one of anger or disappointment, just hollowness and a sense of stupidity for misplacing my trust and sporting aspirations. But my real cycling heroes aren’t the pros anymore. They are my fellow amateur riders who want to give it a crack, but will never ride in the pro-peloton. They are riders like my old work colleague GE who bought a bike last year and is pushing me every week to train with him as he prepares for his triathlon to raise funds for teenage cancer – and in doing so has lost 15kg. 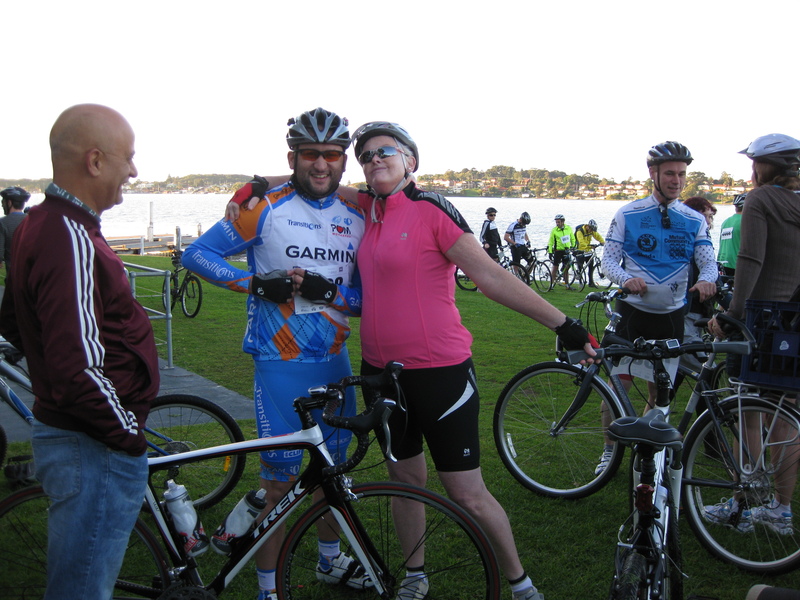 Riders like my mate JB who, after raising over $3,000 for the Chris O’Brien Lighthouse, found out his mother is terminally ill with cancer. Riders like my brother’s crew down in Melbourne who in their late 40’s get together to do training rides up Mount Donna Buang in Victoria (though secretly I think they all have a love affair with a girl named Donna in their heads). Riders like two of the Melbourne Crew’s wives who have joined us on numerous riding treks up stupid inclines. And rider’s like my Aunt, who is over 50 and rings us up to go for a ride. I will soon be helping my Aunt to buy her first road bike, and she will be joining my wife for the Gear Up Girl ride – 2013. College-Tri – a young student from Duke University who is giving cycling (and marathons, and triathlons) a huge go with a second hand bike. Serendipities of Life – Frank Burns who is a retired British teacher who rode 10,000 miles last year, and is planning on riding New Zealand tip to tail. K_Sim’s New Challenge – a Japanese cyclist who rides in some of the most beautiful places, maps out his rides with photos and writes his posts in both English and Japanese. Thinking About Cycling – Dave Horton who is a sociologist and writer and has posted some of the most intelligent and thought out posts on how to enable the community to ride. All Season Cyclist – an American cyclist who rides in EVERY weather condition, and tells us all his best tips for gear and clothing. Richard Tulloch’s LIFE ON THE ROAD – An Australian writer and rider who is fortunate to see cycling from two different cultural perspectives Dutch and Australian. Alex’s Cycle – a young British student from Manchester who goes on HUGE cycling tours on his summer holidays. Love thy bike – a kiwi cyclist whose feats of bombing down a volcano in Hawaii I hope to emulate later this year in May. Women.Cyclists – an American cyclist who is super passionate about all things bike, as is her partner Jason too. Single Speed Slogging – a single speed mountain bike rider who goes hard and races on his rig. Rev Rider – the cycling pastor who has clocked up 20,000 miles since 1 Jan 2010. Bike War – the provider of two wheel eye-candy. Tight chains all – and I hope the road or trail is sunny and with a tail wind. Hey, that’s me!! Gawhhh thanks! 🙂 I’ve been ignoring posts about lance but read yours because I like your blog. So I’m glad I did! No probs and thanks for the comment. There are some cool other riders out there too and I am discovering more through writing this blog. Don’t get me wrong, I like watching the pros and they do some pretty amazing things, it’s just that the majority of them disappear not long after they have their run and go back into society to become… normal people who just happen to be good at riding. Check out some of the other guys in the list when you get the chance too, a couple of them are going to do some big things on two wheels this year. For me, cycling has never been about Lance, LeMonde or any other personality. It’s about that feeling I had when the training wheels came off, at 6 years old. That, and the realization that I could get anywhere in my neighborhood under my own power and have a ton of fun at the same time. Same kid now just with a bigger bike (or two). BTW, cool links – even saw my own in there :). I totally agree with you, it is not about the pros. But I do enjoy watching the best go out and smash it. Since starting this blog last year, I have really enjoyed discovering other blogging cyclists and their adventures. And now my boy is riding his balance bike, I am rediscovering riding through his eyes and the adventures that he is having.